A backhoe stands behind the statue days before it was demolished. MANILA, Philippines — The statue depicting a comfort woman should not be placed in a government property to avoid insulting the Japanese, President Rodrigo Duterte said, adding that Japan has already paid for its actions during its occupation of the Philippines World War II. The two-meter-high bronze statue was located along Roxas Boulevard in Manila and was unveiled last December by the National Historical Commission of the Philippines. It depicted a blindfolded woman who symbolized Filipinas who were forced to work in military brothels during the Japanese occupation of the Philippines. Japan, a top trading partner of the Philippines, had described the unveiling of the statue as "regrettable." 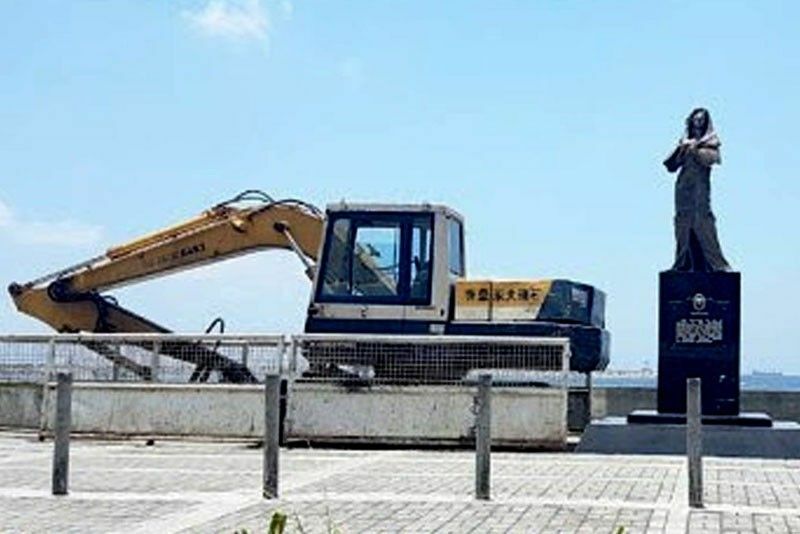 Last Friday, the controversial statue was removed by the Public Works department to give way to a drainage improvement project, angering activists who claimed that act insulted the memory of women who suffered during the war. "According to the Japanese Embassy in Manila, the Philippine government notified it before taking the statue away," the Japan Times said in an April 28 report. It also noted that "the embassy had expressed concerns over the statue, one of many sprouting up in South Korea, the United States and elsewhere to memorialize an episode of history Japan would rather forget." Duterte said the statue should have been placed in private property since it is not the policy of the government to antagonize other nations. Duterte has, himself, had colorful comments for countries, organizations and people he has perceived as criticial of his administration. "You can place it somewhere else. If you want to place in a private property, fine...insofar as I'm concerned, tapos na 'yan (the issue has been settled). The Japanese have paid dearly for that. The reparation started many years ago. So let's not insult them," the president said. "But if there is what you would call a memorial for an injustice committed at one time, it's all right...it is not the policy of government to antagonize other nations," he added. Duterte said placing the statue on private property would not stir much controversy because it would be covered by freedom of expression. "If is erected in a private property, fine. We will honor it. And the Japanese government and people would understand it that there is democracy here, freedom of expression is very important," the President said. Duterte said Japan, which occupied the Philippines from 1942 to 1945, has apologized to the Filipinos for its wartime actions. "And they have certainly made much more than (that) in terms of reparation," he said. Manila Mayor Joseph Estrada said the city government had nothing to do with the comfort woman statue’s removal but did not disagree with it. "The city government has nothing to do with the removal of the comfort woman statue in Roxas Boulevard. What I know is that the site will be hit by a road-widening project of the national government, specifically the DPWH," Estrada is quoted as saying in an earlier report on The STAR. The mayor said the group which had the comfort woman statue erected should bury the bad past of the Filipinos. "We should not allow the bad past to dwell in our system. We should bury it along with the bad things that occured in the past," Estrada said.